For Viewlexx, a trusted offshoot of I-F’s empire, 2015 marks the 20th year in the business. 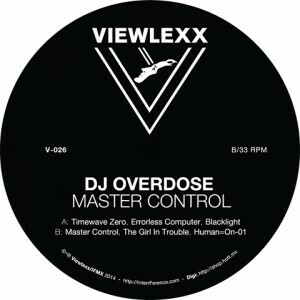 The journey that once began with “Portrait Of A Dead Girl 1”, continues with DJ Overdose’s “Master Control”, a new EP by the master of robust electro funk. However, the opener deviates from the familiar line, when catchy italo hommage “Timewave Zero” sounds like DJ Overdose hanging out with Bordello A Parigi fellows. After negotiating some curves in the autostrada, “Errorless Computer” is hooked on the 1980ies in slick West Coast boogie for the Hollywood Wives pool party. Heavier blows emerge in darkish “Blacklight” and the title track “Master Control” has the honour to represent the Dutch hallmark electro. Planet Rock beats of “Girl In Trouble” drive a grim tale about an adolescent in drama and “Human=ON-01” says farewell with sun-lit pads at calm shores. In recent years, the label has kept a sluggish pace with new stuff, the previous release being Cliff Lothar’s “White Savage” with a couple of represses. For this spring, remastered versions of “Test Pilot” are announced and hopefully there will be more fresh produce from the legendary imprint.